We at Rohit Cutting Tools India manufacturers CSK type HSS PUNCHES. We also manufacture HSS Punches in Square Punches or Block Punches, Flat Punches, Hexagonal Type Punches, Shoulder Punches in HSS M2, HSS M35 7 HSS M42 grade as well. - Other angles can also be provided on interest. - MDW Products are made from the best imported tool steel avaliable in the international market. - Dies are designed to resist the highest of impact & thus have long service life. MDW provides constant size & finish, as all the size are produced in mass quantity. 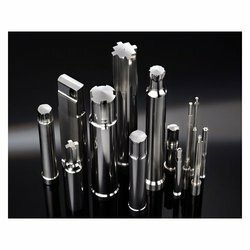 Along with our standard and specially designed range of Piercing Punches we also manufacture them in exact accordance of diverse industrial requirements of our clients. We have requisite resources to fabricate these punches in exact accordance with the drawings or relevant design and technical specifications of our clients. 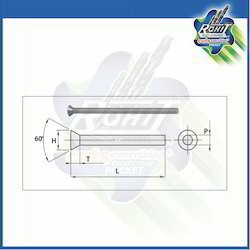 We are manufacturers of high quality Piercing Punches made of High Speed Steel M2 material. Supplying all over India and abroad. We are offering HSS Piercing Punches. We are offering Piercing Punches to our clients.